Lombardy Italy stretches from the Po river and the central Alps. 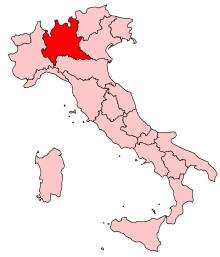 The territory of the Southern Region is the central part of the Po Valley, limited to the west by Lake Maggiore and the Ticino river and eastward from Lake Garda and Mincio river. A narrow band of hills follows the mountainous area, the pre-Alps and the Alps, which reaches increasing altitudes moving towards the north, where we find the border with Switzerland. Iit borders Trentino-Alto Adige and Veneto to the East, Emilia Romagna to the South and then Piedmont to the West. Its territory, which stretches from the Alps to the lowest part of Po valley, gives rise to a wide variety of landscapes. Of singular charm is the scenery of the Alps with the Valchiavenna, Valtellina and Valcamonica. Another characteristic landscape of the region is provided by rolling hills among which stand out the area of Franciacorta, famous for its vineyards and wine production. Typical of the region are the great plains of the lower Po valley covered by water and cultivated with rice: it is the landscape of Lomellina, a land rich in folklore and traditions. Favored by geographical location and soil resources, Lombardy is a rich land where nature, history, art and culture are combined with innovation, technology, fashion, fun and modernity. For lovers of winter sports, Lombardy offers modern facilities and equipment in popular locations like Tonale, Bormio, Livigno and Madesimo. • Lake Garda, or Benaco, the most extended of the Italian lakes, whose banks belong to the western Lombardy, Veneto to the east and in the northern par of Trentino. Lake Garda: like other pre-alpine lakes, has the elongated shape reminiscent of its most remote glacial origin. Today, the mild climate and natural vegetation suggests rather a Mediterranean coastline. Olive trees, cedars, oleanders, magnolias, agaves and palm trees grow there and its waters are very transparent with shades of blue.